Finding the perfect gift for someone who already has everything seems to be a common dilemma in life. Nearly everyone has experienced the frustration of wandering the aisles of every store in the local mail looking for just the right gift for a special occasion. Mom's Birthday is approaching and the last thing she needs or wants is another bath set or robe. Father's Day is fraught with anxiety over what to get the man who does not need another tie or electric shoe polisher. A unique gift is now available that can be personalized for any special occasion. Retro candy gift boxes offer something for everyone, even for the person who already appears to have everything. These gift boxes can be personalized to meet even the fussiest of gift recipients. The retro candy gift boxes can be ordered by the gift recipient’s year of birth. 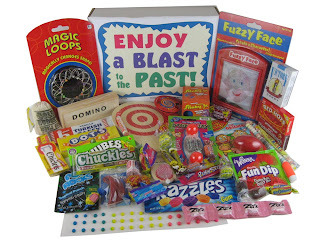 The gift box will include nostalgic trivia from that year, as well as sweets that were popular during the person's childhood. Toys and trinkets from the era chosen are included in these gift boxes. These one-of-a-kind gift boxes are not limited to birthdays. They can be personalized with the gift recipients’ name. These candy treats and neat little gadgets can be given for any special occasion. Even the occasion can be personalized and printed on the gift box. Need a get-well-soon gift for the boss? These candy gift boxes provide a perfect solution and certainly will stand out from all the flower bouquets and cards. Personalize the gift box and the boss will never forget the thoughtfulness of this gift. It is all too easy to fall back on the old stand-bys when a gift-giving occasion sneaks up on you. In our busy lives, it is hard to plan ahead for all of the special days in our friends and family's lives. No one wants to feel forgotten on their special day; so many of us send the same old token gifts at the last minute. This allows most of us to feel like we have done our duty, and we assumed the gift recipient will be happy that we remembered their special occasion. The true spirit of giving a gift on a special occasion is the thoughtfulness that goes into the gift. Giving retro candy gift boxes or baskets with personalized options is a wonderful way to avoid mindless gifts on special occasions. The person receiving the gift box will feel special and appreciated. When someone receives a gift personalized in so many ways, they know that time and effort were given to them out of thoughtful planning on your part. The gift recipient cannot help but know that you think of them often, and that you have listened to them in order to personalize a gift just for them. When they realize the care and effort you put in to get just the right items in their gift box, they feel your thoughtfulness is an additional wonderful gift. Give with thoughtfulness, personalize a retro gift box for the next special occasion, and receive thanks gracefully. Have You Got a Case of Candy Nostalgia?